This is a National Historic Landmark. Many early automobile firms, including Ford, Cadillac and Lincoln, were founded by mechanics or skilled craftsmen we would call engineers today. General Motors has a different origin. Will Durant was much more of a salesman, an entrepreneur and a financial expert than a mechanic. The grandson of a governor of Michigan, he was born the year the Confederates fired upon Fort Sumter, Durant joined with Josiah Dart to establish a carriage firm in Flint in 1886. By 1900, Durant-Dort was the nation's largest carriage maker. They successfully sold their carriages throughout much of the nation. Their office in Flint is also a National Historic Landmark. In 1902, Durant drove both steam- and gasoline-powered cars, but was unimpressed and concluded that motor vehicles would not challenge his firm's prosperity. Two years later, he drove a car built by Flint-resident David Buick and quickly recognized that his future was in the automobile business, not the carriage business. Durant worked with Buick to develop the prosperous Buick Car Company. In 1908, he approached J. P. Morgan for financing to create a huge International Motors Company. Durant's sought a loan to purchase the small but growing Ford Motor Company. A timid Morgan was willing to provide only limited financing, so Durant changed the name to the more humble General Motors. By 1909, Durant secured enough financing and had sufficient financial imagination to acquire Buick, Cadillac, Oldsmobile and Oakland: the make the we use to know as Pontiac. A year later, Durant's General Motors owned 11 different auto makers and 19 suppliers. The firm, however, lost money and so the investors ousted the high rolling Will Durant. In 1911, Durant met Louis and Arthur Chevrolet who came from France to race cars, not build them. Durant recognized the mechanical skills of Louis Chevrolet and joined with him, to build Chevrolets in Flint and Detroit for the upscale trade. Durant recognized the popularity and financial success of Ford's recently introduced Model T so, while Louis Chevrolet visited his native country, Durant switched Chevrolet into a producer making cars for the mass market. When Louis Chevrolet returned to Flint and discovered this tremendous shift and quit the firm leaving it to be run by Will Durant. Durant's Chevrolet prospered and he used his substantial profits to buy stock in GM. By 1916, he amassed enough stock to join with the DuPont family in controlling the booming General Motors firm that had booted him a few years earlier. Durant merged Chevrolet with GM, creating the lineup of name plates still produced in this country. Durant's skill involved the financial legerdemain needed to acquire producers and suppliers. Indeed, by the early 1920s, he was acquiring much of the body firm owned by the seven Fisher Brothers who were also sons of a prosperous carriage maker. The automobile business prospered after World War I. Not only, cars but trucks and tractors sold in great numbers. In 1920, Durant asked Albert Kahn to design the largest office building in the nation for his firm—the huge structure that you see pictured above. Durant was much more successful in building firms than in managing them. Late in 1920, the lenders supporting GM and the other directors of the firm found fault with the decisions Durant made and ousted him from managing the firm for the second and final time. In 1921, Durant founded Consolidated Motors to compete with GM. He once again prospered as the firm built cars and trucks using 12 now-forgotten name plates: Chandler, Eagle, Flint, Gardner, Huppmobile, Jordan, Locomobile, Mason, Moon, Peerless, Princeton and Star. History repeated itself and, two years before the Depression, Durant was ousted from control of this producer. During the Depression, Durant tried unsuccessfully to build and sell inexpensive French-designed cars. In 1936, he declared bankruptcy, c laiming assets of only $250. In the interval between 1900 and 1929, Durant amassed and lost fortunes four times. After bankruptcy, Durant ran a bowling alley in Flint and, in his final years, was supported by contributions, not from GM, but from his colleagues who has prospered. Durant, presumably, wanted to locate his General Motors headquarters near Detroit financial district but land was not available for the huge office building he had in mind. He selected a Detroit location for his building far from the city's center. Since space was not a constraint, Kahn did not have to design a tall building. As a result, the GM Building has four 12-story wings so that each office gains exterior light. Kahn's use of classical inspiration is obvious from looking at the loggias on West Grand. I know of no other business or commercial building that has such an attractive and classical entrance as this one. Please notice the detailed and impressive sculpture about the entrance including the eagles that guard the traditional clock with its Roman numerals. You might think also about Kahn's creativity with regard to fenestration. There are many, many similar windows reminding us that Durant created GM's wealth through the production of vehicles sold to the mass market. But the arches at the ground level and the pillars toward the roof line suggest that Kahn carefully planned his use of windows and fully understood their ascetic effects. Almost all Kahn-designed building maximized the flow of light from outside to inside. Two aspects of this building impress me. Standing across West Grand from this building, you are struck simultaneously by its size and the message that Durant wanted to convey—GM dominates the vehicle business. The other is the contrast with the headquarters building that the identical architect, Albert Kahn, designed for Henry Ford about eight years earlier. Within 25 minutes you can walk northwest on Woodward and compare the GM building to Ford headquarters in Highland Park. This difference, I suspect, reflects the difference between Will Durant and Henry Ford. Durant did not suffer from excessive modesty. Perhaps, the Chevrolets introduced him to the arts, designs and sculpture of Paris. Durant claimed that he got the idea of using a bow-tie as the insignia for Chevrolet from the elegant wallpaper in a room of his Parisian hotel. Napoleon, who also appreciated architecture, insisted that a large N be sculpted into all building constructed in his reign. Toward the top of the GM Building, you find a D reminding us of the man who founded GM, not Detroit. The GM Building was completed in 1923, the year that Alfred Sloan took over management of the firm and built it into the world's largest. The GM Building is now a State of Michigan office building. 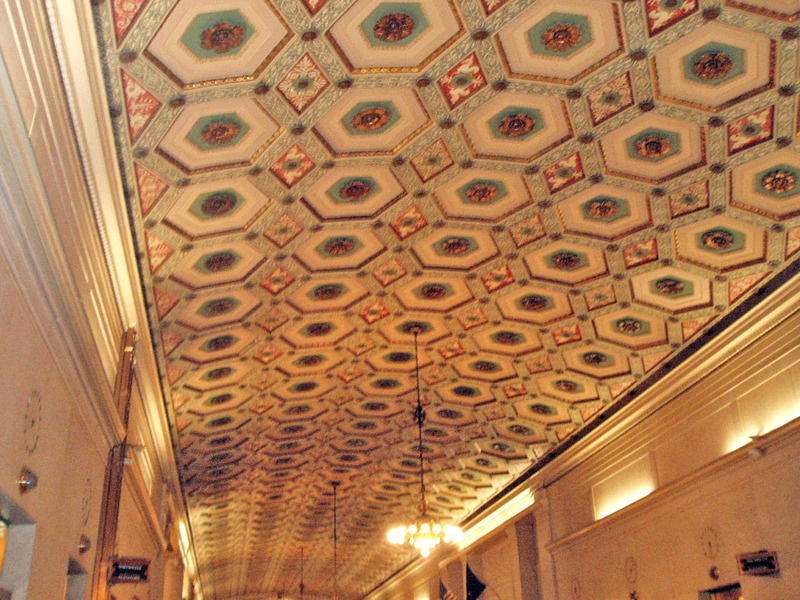 You can walk in and gaze and the marvelous lobby Kahn designed. When you visit West Grand Boulevard, there is much to appreciate in addition to the studio at 2648 where Barry Gory created the Motown sound and the memorial park at West Grand and Rosa Parks where you find Oscar Graves' classical bust of Dr. Martin Luther King. You can have an architectural experience that may be unique in this country. It is not too difficult to find adjoining buildings listed on the U. S. Park Services' National Register of Historic Sites. 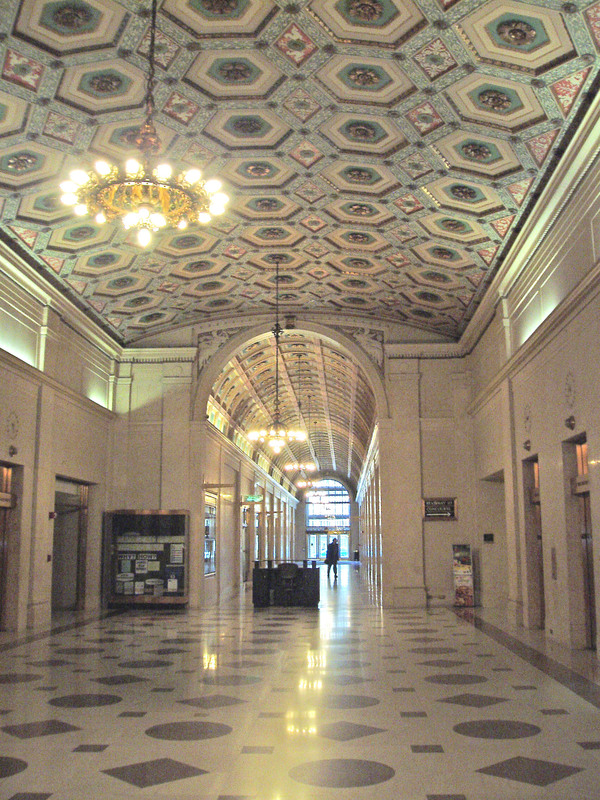 Buildings designated as National Historic Landmarks, however, are rare. Both the GM Building and its companion across West Grand, the Fisher Tower, are National Historic Landmarks and, remarkably, both were designed by Albert Kahn. I do not know of any other location in the country where two National Historic Landmark buildings face each other. In 1996, GM purchased the Renaissance Center on the Detroit River and began moving their offices there. 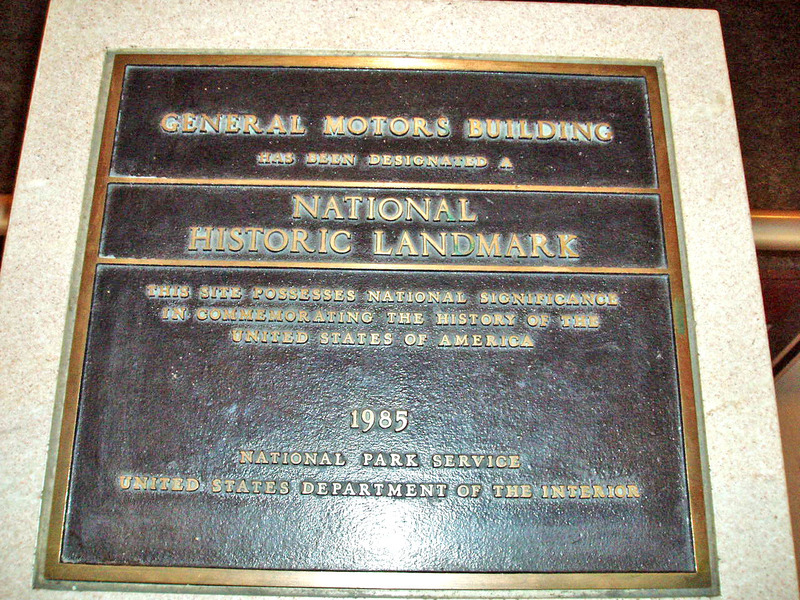 The State of Michigan took over the GM building, renamed it Cadillac Place, and centralized state offices that had been spread across southeast Michigan. 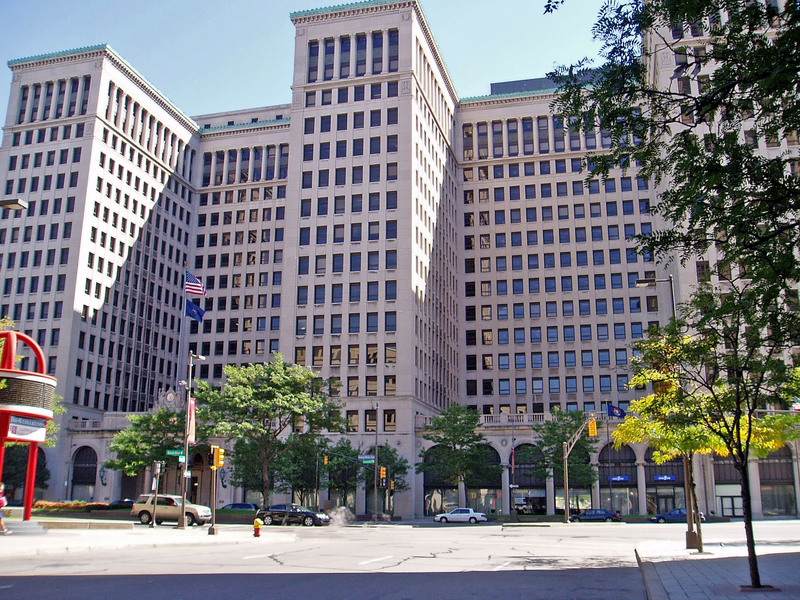 Employment in the Cadillac Square Building may exceed what it was in the GM Building. 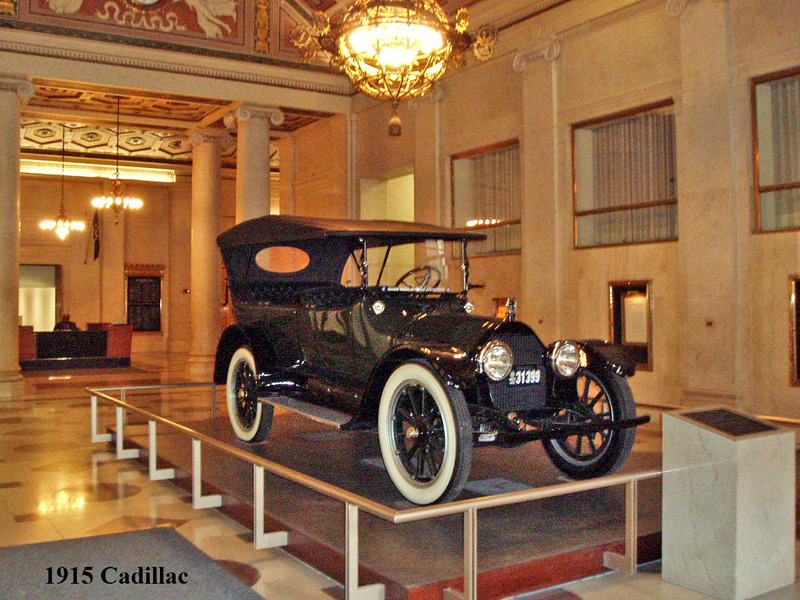 Because he founded the city in 1701, it is appropriate that Cadillac's name be applied to many locations in today's Detroit. However, it leads to some confusion. There is the Cadillac Tower Building at 97 Cadillac Square. There was also a Cadillac Square Building once located at 17 Cadillac Square. This was an office building that was purchased by the state of Michigan in 1944. However, the state gradually moved their offices away from that structure and it was razed in 1976. The Cadillac Square Hotel was built at 111 Cadillac Sqaure in downtown Detroit. That building was refurbished recently and is now known as the New Cadillac Square Apartments.